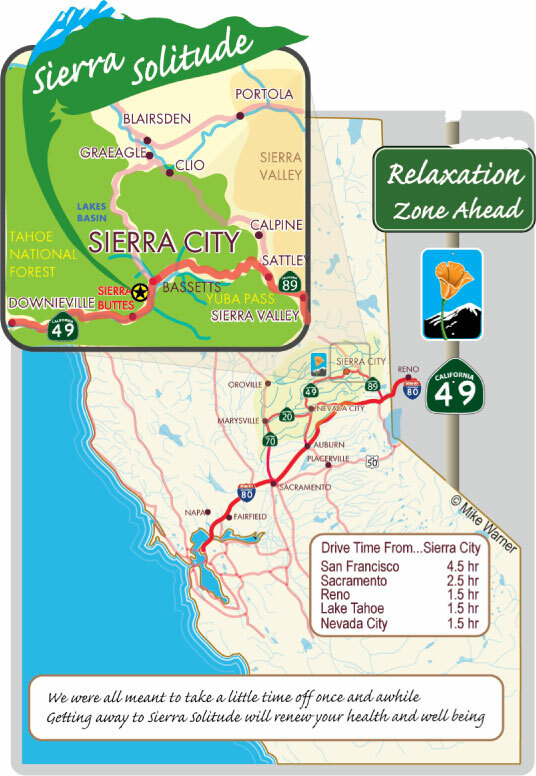 Our vacation home is located in Sierra County directly off Highway 49, between Sierra City and Bassetts. Driving time from San Francisco is approximately 4.5 hours, from Sacramento approximately 2.5 hours and from Reno approximately 1.5 hours. There are several different routes you can take to get here from the Bay Area and they are all about the same driving time (depending on traffic). The most direct route is probably via Auburn on Highway 80, and then from Auburn on Highway 49 through Downieville and Sierra City (in winter this certainly tends to be the fastest). However you get here you are assured of a gorgeous drive, since all routes ultimately take you along the stunning Yuba-Donner Scenic Byway. Below are two sets of directions for the most direct routes from the Bay Area. Please do email us for any additional information or for help with directions from out of state. You will drive 45 miles along this road and then come to Downieville. In Downieville, take a right over the bridge across the river and continue on this road (still Highway 49!) for another 12 miles until you reach Sierra City. This is all part of the Yuba-Donner Scenic Bypass and you will enjoy some gorgeous scenery! At Bassetts, stay on the main road (Highway 49) for another couple of miles. You will cross a bridge (Salmon Creek Bridge) and we are the first right at the end of the bridge (Salmon Creek Road). On Salmon Creek Road make a left, and you're here! For additional information, or for help with directions from out of state, please do email us.